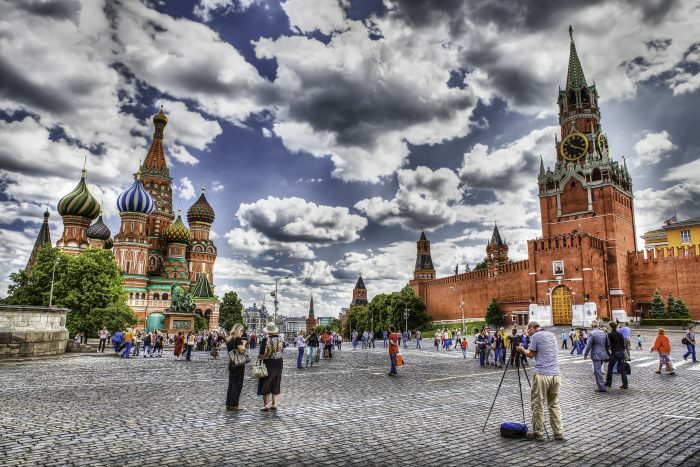 There is a lot to see in downtown Moscow, and though not all attractions fall into easily runnable areas, our ‘runseeing tour’ maps out the major sites, from the Alexander Gardens, to the Kremlin, to Christ the Church Cathedral and back to Red Square. Using the river embankment as a connector, this route crosses gorgeous pedestrian bridges and plazas, offering a quick tour of Moscow’s iconic architecture at whatever pace you want to run. Enter the gardens from the north side (the Manezhnaya Square bus stop near the Four Seasons hotel is a good starting point). Head south past the State Historical Museum and Nikolskaya Tower towards the gardens, a beautifully landscaped area just outside the Kremlin Walls. At the south end of the park, cross Borovitskaya Ulitsa and continue towards the river. Take a right along the river embankment and follow it west towards the elegant golden domes of Christ the Church Cathedral. From the cathedral, a pedestrian bridge will carry you to the other side of the river, where you can continue along the embankment until the Bol’shoy Moskvoretskiy Bridge. Cross back over and continue north up Red Square, with St. Basil’s Cathedral on your right and Lenin’s Mausoleum and the Kremlin walls on your left. This will complete your 4.8 km (3 miles) loop in Manezhnaya Square. Note this is a popular tourist area, so you may run into crowds along the way. Add-On: We also recommend the ~1km of trails in Zaradye Park, just east of St. Basil’s Cathedral. This new park is an architectural gem, featuring a tourist information center, underground Archaeology Museum, Nature Center, and a spectacular cantilevered bridge over the river.